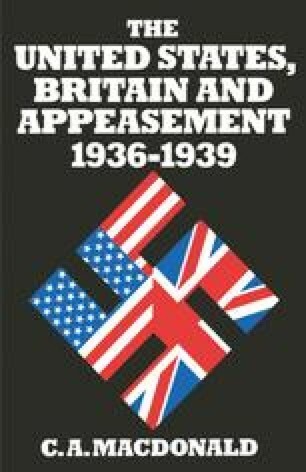 At the end of 1936 the United States began to use its influence to stimulate appeasement in Europe. The object of American intervention was to secure peace, stability and the expansion of international trade in the interests of world order and domestic recovery. It was hoped in Washington that a final settlement of European problems outstanding since the peace of Versailles would establish the rule of law in international affairs. A just settlement in Europe would be guaranteed by the liberalisation of world trade which would give every power an interest in the new system and eliminate the grievances of‘have-not’ nations such as Germany and Italy. Since mutual suspicion prevented the European powers from reaching a final settlement, it was believed that the United States must intervene and lend its moral leadership to the cause of peace. As a disinterested outsider, uninvolved in European power struggles, the United States might perhaps establish a basis for settlement upon which Britain, France, Germany and Italy could agree. These objectives were first collected into a definite peace plan by Sumner Welles in November 1937, but they had been under consideration in administration circles since the summer of 1936.